My friend wanted to eat the fried fish fillet noodle in tomato soup again so we went back to HoMinSan, Midvalley Mall. Previously I ordered the dry flat noodle with braised pork and mushroom (MYR 11.82 nett) and find that the gravy is too heavy. 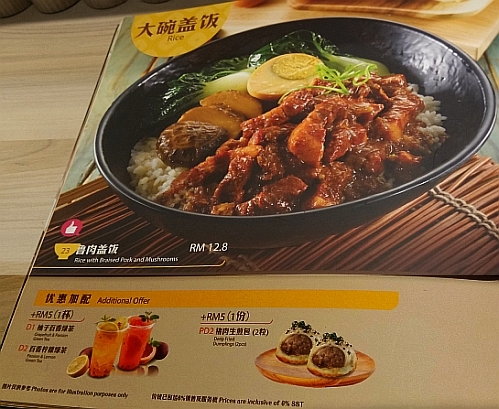 This time I made the right choice because the rice with beef brisket and white radish at MYR 15.85++ (10% service charge and 6% SST = MYR 18.39 nett) is tasty. There are 2 pieces of beef briskets, 1 piece of beef tendon, 3 pieces of white radish, 2 pieces of nai pak vege and lots of rice - the rice grains are plump and fleshy. 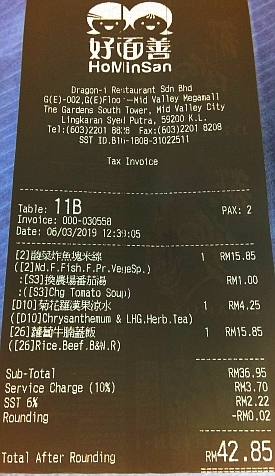 Bill for two pax is MYR 42.85 nett. This eatery is full house during lunch time so it looks like they are doing well. Please click on the above menu for a larger image. 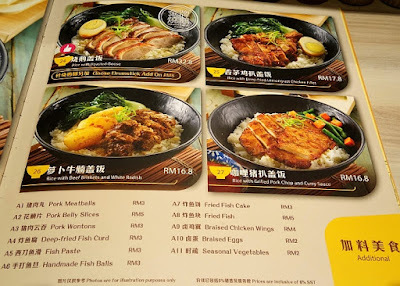 These are the rice dishes. Next time my friend eats here, maybe I will order this rice with braised pork and mushrooms. Hopefully the braised pork will have more lean meat than fatty bits. 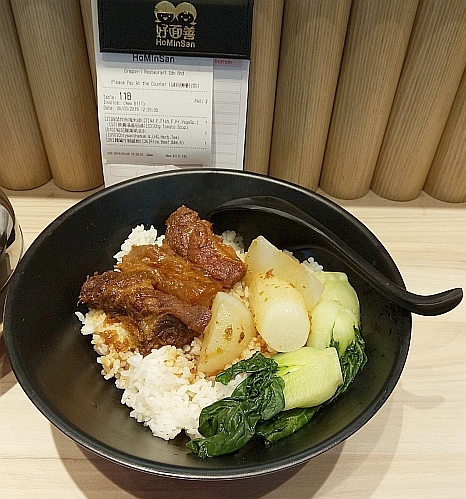 That looks like a Taiwanese rice dish that I had here before - I had the pork, very nice. You mean the lu rou fan that is commonly sold everywhere in Taiwan? Can request for leaner meat next tine. The beef is ok. But for the braised pork, I believe it is ready cooked in one huge pot so would be difficult to select leaner meat from the pot. It is different if each dish is cooked from raw pork. same here. I always think of the cows when I am eating beef. Poor cows, must say a prayer for them. oh, so this is subsidiary of dragon-I....hmmm food must be good there since it is crowded. The lunch crowd love this place. Beef! Yummy! LOL! I just had the beef brisket soup noodle at Mak's Chee last weekend. Not as nice as I expected. I think you would prefer this one because the one at Mak's Chee is not as flavourful and the portion is small. Rice with beef brisket looks good and based on your approval, I'll take this as a recommendation the next time I dine here. Do write about it if you have tried it. Hopefully the braised pork will have more meat, full stop! They aren't too generous with the beef pieces. Due to the fact that beef is expensive perhaps.